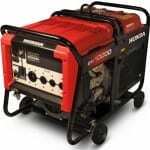 Generators are very essential in Nigeria because of epileptic power supply. To ensure your generator lasts longer than a year or two there are a few thing you should do and others you should not do. Here is a few tips on how to and how not to operate your electric generating set. You may also be interested in Generator Price by brand. Do not operate gen set with engine oil below the gauge level. Do not operate a generator continuously for longer than the generator is meant to last. For example, some generators are built for 5 hours of continuous usage. Consult the user manual of details of how long it can operate continuously.